The region, Coraki Lagoons is a residential island in Jillaroo State in northwest Irukandji. 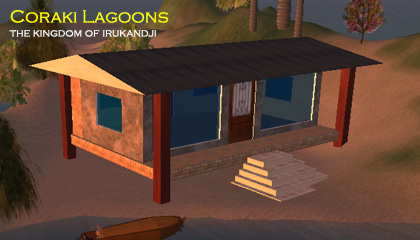 Coraki Lagoons was active during 2008 and was well populated during its time on the Second Life grid. 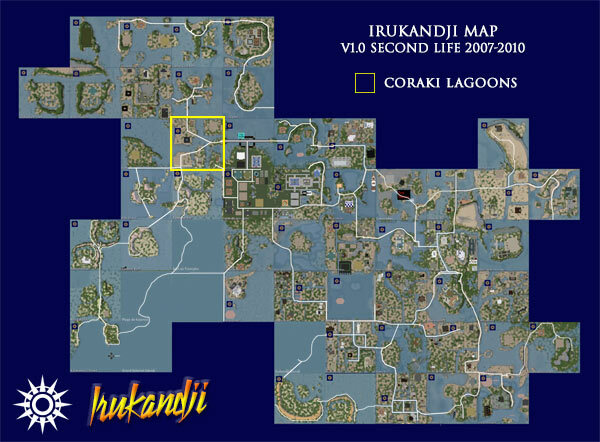 As well as being a significant residential sim, Coraki Lagoons was an important junction of the Trans Irukandji Causeway, connecting 'old Irukandji' via Byron Bay to northern Jillaroo via Tanawayo Bay, and to Kalamat State via Aquitaine Bay. Other adjoining sims were Split Rock Mountain, Palu Island, Mantaray Shoals, Jackaroo Island, and Coolangatta. Unfortunately, only one photo remains of Coraki Lagoons and it isn't a particularly good one. If you happen to have some photos of the island, please let me know.